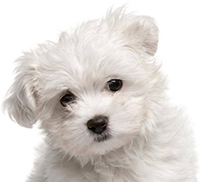 Poodle puppies are lively and rambunctious creatures who are ready for anything. The breed has a long history that dates back several centuries. While many people know them for strutting their stuff at a dog show or performing tricks at a circus, most Poodles end up being a lovable member of the family. They're an incredibly intelligent breed that also happens to be a master athlete. To ensure that your Poodle puppy reaches his or her full potential, you're going to need to start them off right with a high-quality puppy food. Good nutrition is crucial for proper development. To better understand how much food your Poodle puppy needs, there are many things to consider. The first is their size classification. There are three main Poodle varieties. These include Toy, Mini, and Standard. Toy Poodles are the smallest of the bunch, maxing out at about nine pounds as an adult. Mini Poodles don't get much bigger, only hitting as much as 17 pounds when fully grown. Standard Poodles, on the other hand, can get quite large. They can weigh as much as 70 pounds. However, most stay around the neighborhood of 60 pounds. Your puppy's target adult weight is important. All dogs start out small. They experience a significant growth spurt during the puppy stage. Before you know it, your young dog will be approaching their adult size. You need to have a good idea of how big your dog will get to supply them with the right amount of food. While the Poodle size classifications are vastly different, their nutritional requirements remain the same. The only thing that will be different is the amount of food you provide. When you're planning your puppy's meals, you need to look at their food in calories rather than volume. It's also crucial that you monitor your pup's growth as they age. During the first year, your dog is developing muscles, strong bones, and healthy organs. They'll need a lot of fuel to support that growth. To ensure that you're giving them all the food they need, you should weigh your puppy regularly and adjust their food intake accordingly. It's important to invest in nutritional puppy food that can support your puppy's growing body. Here's a selection of high-quality formulas that provide a balanced diet. 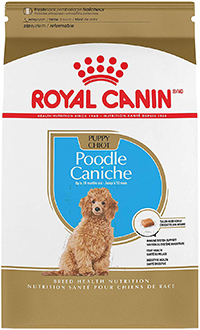 This dry kibble from Royal Canin is specifically designed for Poodle puppies. It's filled with great ingredients that will support their muscular and skeletal development. With a protein content of 31 percent, your puppy will receive all the amino acids they need to grow strong muscles. The kibble is also enriched with EPA and DHA. These omega fatty acids keep your dog's skin healthy so that they can grow that signature coat of hair. To support their changing digestive system, plenty of probiotics are added as well. 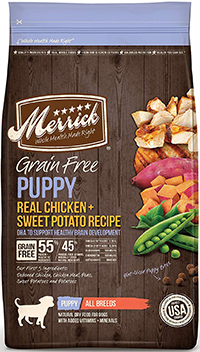 This grain-free formula from Merrick provides a balanced diet for growing pups. 28 percent of the kibble is made up of muscle-building protein. Most of it comes from deboned chicken and chicken meal. The dry food also has plenty of healthy fat to support their growing coat and brain. Healthy doses of calcium and phosphorous are included. These ingredients support bone growth and may be able to help your puppy avoid joint and skeletal issues in the future. 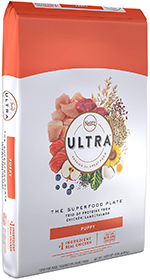 The Nutro Ultra Puppy food contains plenty of high-quality ingredients. Chicken, lamb, and salmon all contribute to the high protein content. Because so many animal meat sources are used, your puppy can get a complex profile of amino acids to support their muscles. The kibble is also chock-full of fruits and vegetables. Ingredients like apples, spinach, and blueberries give your puppy a dose of vitamins. They're also a great source of antioxidants that support your dog's strengthening immune system. This particular formula is ideal for Standard Poodles. 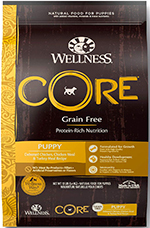 This product from Wellness Core targets many different functions in your dog's body. It supports ocular health, improves their digestive system, strengthens their immune system, and provides plenty of energy. It does this with high-quality ingredients. Chicken and turkey are the main protein sources. They're complemented by wholesome plant-based ingredients like bananas, spinach, apples, and kale. What you won't find in this recipe are artificial additives. It's also free of corn, wheat, and soy, ensuring that your puppy's digestive stays healthy as they reach adulthood. 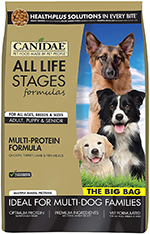 This dry kibble from Canidae can support your puppy's health throughout their entire lives. It's formulated to provide your dog with a healthy diet during all of their life stages. Chicken meal, turkey meal, and lamb meal are the most prevalent ingredients in the recipe. They make up the 24 percent protein content. The food also has a number of beneficial nutrients. You'll find omega fatty acids in the flaxseed, fiber in the peas and bran, and antioxidants in the cranberries. While calorie guidelines do exist, it's important to remember that all dogs are different. Outside factors like genetics, activity level, gender, and much more play a big role in your pup's needs. The best way to approach the feeding process is to start with the recommended values, monitor your dog's health, and adjust meal portions as needed. Poodle puppies are quite active. They're growing up fast and have a lot of new things to experience. This constant activity eats up a lot of energy. Not only that, but their bodies are changing. On average, Poodle puppies will need about 55 calories per pound of body weight. More active puppies may need upwards of 60 calories. On the other side of the spectrum, lazier pups will need about 50. This may seem like a lot of calories for such a small creature, but you'll quickly find that your Poodle can't get enough food. You can use this general guideline to figure out how much food your puppy will need at various stages of development. By this point, your precious Poodle has weaned off their mother's milk. If you adopted your puppy or purchased them from a breeder, they're probably already used to eating dry food. If not, you may have to soften the kibble a bit to get them to eat or start with wet food. Compared to their birth weight, Poodles will be surprisingly large for only being a few months of age. The average weight of a Toy Poodle at three months is about two and a half pounds. They'll only need about 130 calories each day. Miniature Poodles typically weigh about five pounds at this age and need approximately 275 calories to stay healthy. 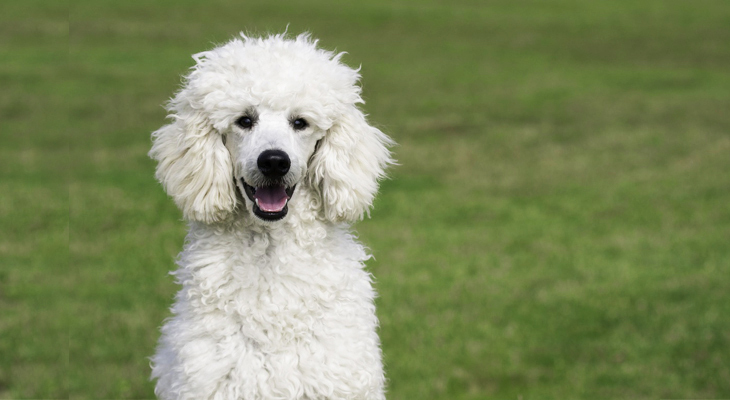 Standard Poodles are well on their weight to reaching adulthood at three months. They should already weight about 20 pounds. This equates to over 1,100 calories every day. At the six month mark, your puppy's rapid growth rate will start to slow down a bit. They will continue to grow, but it won't be nearly as fast as the first few months. You should continue to monitor their growth and adjust their diets as needed. Toy Poodles almost double their weight by this age. They typically weigh in at just under five pounds, thus requiring about 250 calories. By six months old, most Miniature Poodles tip the scales at about 9 pounds. When calculating their requirements, you'll find that they need a bit less than 500 calories a day. At around 35 to 39 pounds, Standard Poodles will do well with just over 2,000 calories of food. Take out the birthday candles and some dog-friendly cake! At this age, they've been growing with you for an entire year. This is a great time to look back on your previous weigh-ins to see how much your puppy has changed. Your Poodle should be close to their target adult weight. They will continue to grow a bit longer, especially Standard Poodles. However, the changes will be a bit more difficult to see. It's still important to monitor their weight to avoid excessive gains. While it may not seem like much growth, Toy Poodles have come a long way since birth. Your tiny canine companion should weigh in at about six pounds and require about 325 calories of food each day. Miniature Poodles have an average weight of about 13 pounds when they are one year old. As a result, you should be feeding them just under 700 calories. At a year old, your Standard Poodle is probably too big to be a lapdog anymore. Most puppies weigh about 50 pounds. They will need between 2,700 and 2,800 calories each day. How Often Should You Feed a Poodle Puppy? Young Poodles need to eat many times throughout the day. When their suckling off their mothers, puppies typically free feed. Their mother is available to them around the clock, so they eat whenever they're feeling hungry. Your dog will have the urge to eat a lot as a result. When they're about three months old, their calories should be split up into four small meals. From there, you need to slowly decrease their meal frequency. When you hit the six-month mark, go down to three meals. At one year old, you should try to work your way down to two meals. Your puppy may not like this very much. If they seem to have a problem with hunger throughout the day, you can continue to feed them three meals for another few months. As long as you go down to two meals by the time they're a full-grown adult, you should be fine. The time to switch your puppy to adult food will depend on a couple of factors. Some dogs take a bit longer to reach their adult weight than others. It's better to continue providing them with a puppy formula than to make the switch too earlier. They need continued support as they make that last push to adulthood. Switching too early can do more harm than good. If you're unsure, it's best to wait and consult with your vet. Typically, Toy Poodles can transition to adult food sooner than Miniature and Standard Poodles. This is because they are considered adults at about one year old. They're done growing. The other two classifications continue to grow, albeit slowly, until about a year and a half. It's important to make the switch slowly. Their digestive system is still quite sensitive to changes. You can ease the transition by introducing small amounts of adult food to their puppy formula. Over the course of several weeks, increase the adult food ratio until you've completed the change. Wet or Dry Food: Which is Best for Poodle Puppies? Dry food and wet food both have their advantages. It's often recommended that you start off with wet food in the first few months of age. Your Poodle's teeth aren't quite ready for crunchy food after they've weaned off their mother's milk. Starting off with canned food gives your puppy the opportunity to develop stronger muscles before they move onto something tough. It should be noted that wet food is usually less dense than kibble. The recipe contains a lot of water, so you'll need to provide more of it to get the same nutritional benefit. To avoid weight gain, you should move onto dry kibble when your puppy is about six months old. Canned food is a delicious food option for developing pups that don't have the ability to chew hard kibble. Here are some great recipes for young Poodle pups. Spoil your young puppy with this wet food from Cesar. It's formulated for growing dogs and includes all the things they need to stay healthy. You'll find high-quality protein sources like chicken, beef, and liver. There's also plenty of vitamins and supplements thrown in for good measure. The food comes in a mash form. It's perfect for young mouths to gobble up. It can also be mixed in with dry food for an additional kick of flavor. 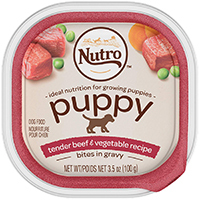 This Nutro wet food is a great option for young Poodles, especially Toy breeds. It comes in a convenient tray for mess-free eating. The recipe is comprised of great ingredients like beef and liver. There are also visible vegetables. You'll find pieces of carrot and peas. The food is very soft and full of flavor, so you won't have any problems getting your puppy to eat. Overall, the recipe is a great option that can support your dog's development. Creating an effective diet plan for a growing Poodle puppy is a lot different than doing so for an adult. They need all the fuel they can get. With a bit of extra knowledge and planning, you can provide your dog with a great diet that helps them grow up to a healthy adult.